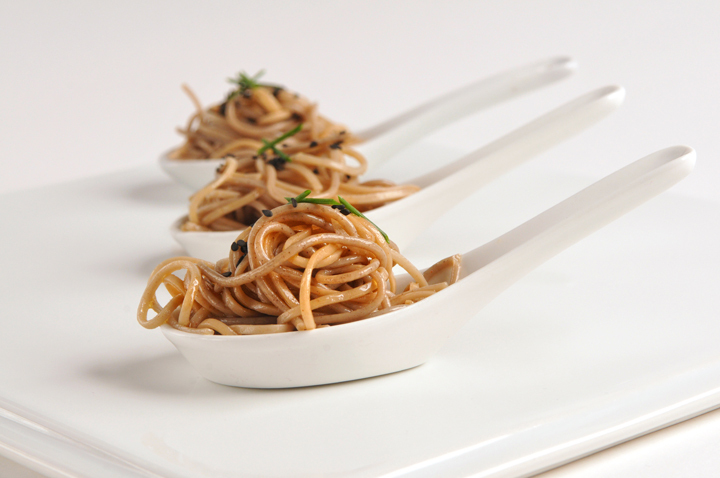 Perfect for spring parties, these bite-size portions of delicious noodles look and taste great. Easy to put together, they are superb on any buffet. For best flavor, go ahead and make them up ahead of time but serve at room temperature. Bring a pan of water to a boil, over medium heat and add the noodles. When the water returns to a boil, add 1 cup of cold water. Continue cooking until water returns to a boil again. Repeat this process 1 or 2 times until the noodles are tender to the bite, 5-7 minutes. Drain and cool noodles in cold water. Let stand in the colander for 5 minutes to drain well. Combine noodles, ginger, chili sauce, vinegar, soy, and oils and stir to coat the noodles well. Toast seeds in a dry pan over low heat until nutty and golden, 3 minutes. Twirl each noodle portion around a fork and make a nest. Transfer to spoons. Garnish with sesame seeds and greens. Serve at room temperature.